This wiring harness does exactly what it says it does, and I greatly appreciate that. I have had no issues with it so far and I don't anticipate any issues in the future! Thank you! Metra Wiring Harness: Metra wiring harnesses prevent you from having to cut your vehicle's factory radio plug when replacing your factory radio with an aftermarket head unit. Simply solder or crimp the Metra wiring harness to your aftermarket head unit's harness (solder & crimps not included), plug the aftermarket head unit's plug into the rear chassis of the aftermarket head unit, and plug the Metra wiring harness into your vehicle's factory radio plug. Wiring Notes: If the Metra wiring harness is not equipped with a ground wire, you will need to ground the aftermarket head unit's ground wire to the metal chassis of your vehicle. Some vehicle's may require you to bypass the vehicle's factory amplifier (in another location from factory radio) or hardwire certain connections. If your vehicle is equipped with factory steering wheel controls, an additional adapter is required & sold separately. installed head unit everything works fine but now my park lights wont shut off ? There are two illumination wires in a Subaru, one that's hot when the parking lights are on and another that's controlled by the dimmer and has variable voltage depending on the dimmer setting. You probably connected the wrong one. What about the wire for steering wheel controls and antenna booster? the wires on the harness does not completely match up with the wires from the radio. the Subaru harness has extra wires. what do i do with them? 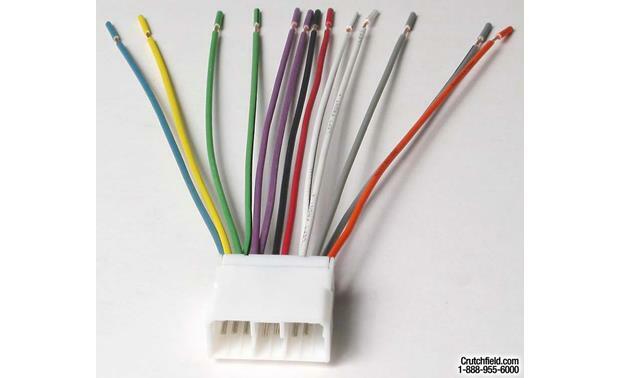 Searches related to the Metra 70-8901 Receiver Wiring Harness Connect a new car stereo in select 1993-up Saab, Subaru, and Suzuki vehicles.